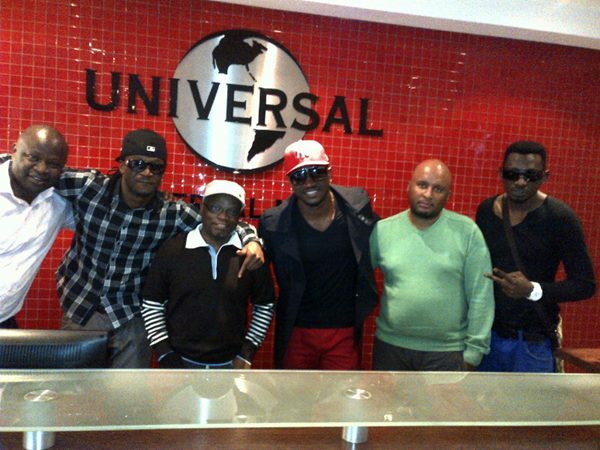 P-Square has signed a distribution deal with Universal Music, South Africa. The deal was signed and sealed this afternoon at a press conference in Johannesbourg, South Africa. The music label will be releasing past and future projects with them; and handle all their digital and CD sales all over the world. These guys keep rocking. Congrats to them! Big up they are really makin it. Which one is this one again? *sighs* Yes you guessed it! I'm a hater!! LOL. Nah for real tho! This is really great news and it is certainly a good look for the Nigerian Music industry!!! 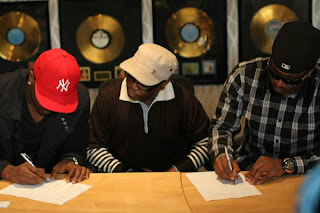 I thot mr d'banj was making noise about bringing UMG to Africa, so they actually had a presence in SA, the guy just dey run mouth anyhow(bighead) much ado over nothing... Anyways congrats to the men of the moment P-SQUARE more grease to your elbow and keep making us proud. Goodluck to my favourite 9ja artists. ds boys r doing it big. am impressed. Linda baby, i am as much a fan as you...pls lemme borrow ur line: THESE GUYS KEEP ROCKING! I love P Square...Period! I'm not in anyway surprised. Hardwork pays and foresight and perseverence is the key to success. I'm happy for this duo. At least goodnews can come from Nigeria apart from stories from thieves in Abuja. Making Money,Keeping the channels open,Representing, Straight up success!.. I truly think these guys are Africa's biggest artistes. I admire them. Kudos P-Square. Lanictx, just curious what part of naija are you from cos it is typical of people from the East and all those areas not to recognize when people have done well and just blindly support anyone from their area. Dbanj has done well for himself and exposed himself beyond naija, p square are doing the exact same thing so what are you yarning? THIS IS THE GREATEST NEWS IN THE HISTORY OF NIGERIAN MUSIC! UMG- a member of the big 4! Congrats my brothers. More blessings! Nigeria has to stand still for these guys. UMG? ?- this is more than I can bear. WE ALL DO!!! N GET D HELL OUTTA HERE! Wait wait, who go chop this money, Linda na you? So it's true...finally confirmed?? If so, then it is right to say these are the biggest guys on the African entertainment scene. Thanks Paul and Peter for doin' Nigerians proud. We are proud of you! Much more blessings...Happy June y'all. These guys keep moving up by the day, I bet they have large fan base in Africa that's why Universal music is interested in signing as I know they don't do baad deals.......Peter, Paul & Jude keep doing what you do best. Now we know where that Private Jet Came... These guys r kings jor... @Lacrtix... D'banj said he was bringing def Jam 2 africa not universal..
Congratz to dem...iv always known dey will be bigz...hard work surely pays! Congrats 2 J towns finest, smoba 4 ever. @Anon 7:29, u r just spot on. these guys are not just Nigerian artistes buh African artistes. like u said they may never win a grammy buh they truly own african music. They are just something else. well positioned, strategic biz men and extremely talented. who says you have to go to London or NewYork to make it. BIG ARTISTES DO BIG THINGS!!! CONGRATULATIONS TO P-SQUARE.. BY THE WAY PEOPLE, ITS NOT A COMPETITION BETWEEN D'BANJ AND P-SQUARE. WE ALL NIGERIANS. This goes a long way to show us that hardwork pays. My sincere congrats 2 them, keep up the good work boys.!! @Hun?...even your name is as LamE as your remark. What in essence is SOPHISTICATION,if I may ask...to speak English?? BUSH-MGBATI AFRICAN MENTALITY!! and what from hell is "ni lele ni be yen"...what esoteric tongue is that? FYI, one does not need to speak "your English" to be a renowned success, and SOPHISTICATION DOESNT have anything at all to do with English. These guys are Naija's biggest artistes...STOP HATING ON THEM. Linda, pls stop publishing some of these "hate remarks"..I suggest again. we take a step forth, and these tribalists take us twice back...#JUST SAYING#. CONGRATS MY BROS, P SQUARE...WE SO PROUD OF YOU GUYS!!! P SQUARE IS INDEED THE BIGGEST IN AFRICA. P SQUARE...100 TIMES BIGGER THAN D'BANJ (my humble opinion). these guys no dey tire...everyday, another feat. make una enjoy; na God giv una! CONGRATS! UMG GROUP...O BOY, NO BE SMALL THING O! Pretty sure Linda would follow this up with posts on her other 2 fav topics..Mohits and Genny..u re aware we got other Artists and Celebs in 9ja..oh and congrats Peter and Paul..my personal person to me..